Phuket is undoubtedly a romantic and popular honeymoon destination. A great variety of romantic activities are readily available, from idyllic strolls along the beach to romantic sunset dinners. The Nakalay beachfront dining is a dining initiative of Thavorn Beach Village Resort & Spa as part of the mission to offer unique guest dining experience, specializing in one-of-a-kind tailor made beachfront dining experience in Phuket. Couples can make their time in Phuket a memorable one with the most romantic dinner Phuket could offer. 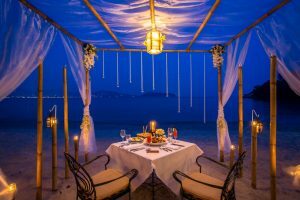 Situated on the secluded Nakalay Beach (next to Patong and Kamala), the Nakalay beachfront dining allows couples to dine in a private candle-lit beach cabana with their toes in the sand. In this exclusive and incredibly romantic setting, couples will enjoy the finest cuisine under candle light with gentle sea breeze on their faces and the beautiful lights of Patong Beach twinkling in the distance. The restaurant offers a choice of 5-course set dining or ala-carte menus from their renowned Old Siam kitchen, serving authentic “royal-inspired” Thai cuisine. For couples looking for the perfect romantic dinner in Phuket, please visit www.phuketromanticdining.com and book your table.